John Archibald has now joined in sports-nerd-bingo. Birmingham once had two daily newspapers. Today, it has none. Owner Advance Publications turned the Birmingham News and its website al.com into two new companies, Alabama Media Group and Advance Central Services Alabama. It has followed through with similar plans in many of its other markets across the country. One year ago today, the Birmingham News ceased daily publication after 124 years and began a thrice-weekly schedule. That same day saw similar transformations in Huntsville, Mobile and New Orleans, which has since gone back to publishing 6 days a week in two separate publications. Circulation has dropped year to year. Site traffic has risen. Both companies have changed leadership. Before looking ahead to year two, let’s examine the key questions from the last 12 months under Alabama Media Group’s digital first strategy. • As both companies’ leaders are replaced with those with no previous ties to Alabama, how will that affect the quality of local coverage? • Have the journalists who replaced some of those fired in 2012 improved local coverage? Digital initiatives? Community interaction? • How many unique visitors did al.com have each month in 2012 before Oct. 1? How many unique monthly visitors does it have in 2013? • What was the monthly advertising revenue in 2012 and 2013 for print ads, classifieds and online? • Which coverage areas have improved in the past year? Which coverage areas have faltered? • Will Alabama Media Group be able to sell its current building at $21.4 million? • Will a competing daily newspaper enter the Birmingham market, as has happened in at least two other Advance cities? • And lastly, are we, the people of Birmingham, better off today with the Alabama Media Group than we were a year ago? Update Oct. 2: Amount of local news on page 1 for Oct. 2 edition? 0 percent. The Birmingham News turned 125 today. So obviously we had to have a giant cake. The Birmingham News turned 125 in March. the Birmingham News in 2007, constructed in 1917.
with a Google-sponsored party in January. While the Birmingham News’ reduction in print editions and jobs has received much attention, the plan to put al.com at the forefront has received relatively scant attention. The largest website in Alabama recently changed its front page, and just today changed its dominant color from yellow to a warm gray (as did sister site nola.com). But aside from cosmetic changes, questions remain as to what’s next for the company. Cindy Martin, president and CEO of al.com, will become president of the newly formed Alabama Media Group. Owner Advance has also created Advance Central Services Alabama, to be headed by News publisher Pam Siddall. Martin and various al.com staff members declined requests for interview. “We’re excited to bring together the quality journalism of The Birmingham News, the Press-Register of Mobile and The Huntsville Times and the up-to-the minute immediacy of al.com. This is obviously a dramatic change, but we believe our award-winning journalism, top-notch advertising services and the largest website in Alabama position us to be a healthy, growing company. How many staff members al.com will gain or lose, if any, remains to be seen, as well as how Martin and Siddall will work together in daily operations and hierarchy. Kevin Wendt, editor of the Huntsville Times, will be vice president of content. Ellen Williams, human resources director at the News, will be executive director of human resources. History buffs know today marks the fifth anniversary of the last edition of the Birmingham Post-Herald. Up until that day, Birmingham had been a two-newspaper town for much of its existence. Well, more like one-and-a-half newspapers, as both were operating under a joint-operating agreement. The Birmingham News was the senior partner, handling the advertising, marketing and circulation for itself and the Post-Herald. In essence, competitive entities in name only. Has the News thrived or become complacent since becoming a solo act in 2005? The News has operated for 5 years without another daily paper competing for scoops, but finding itself competing on a new playing field. It had its traditional competitors: radio, television, even the Internet vying for readers for both news and attention. But who knew back then that the state’s flagship newspaper would also be fighting Facebook, and blogs, and YouTube, and Twitter, and a publishing industry implosion? Walk through the News’ building — insiders jokingly refer to the layout as a prison — and you’ll see disturbing signs of a newspaper in decline. Empty desks marking the dozens of jobs cut. The third floor, once home to circulation, now a ghost town; owner Advance Publications consolidated that function for all state newspapers in its Mobile office. In some ways, the 2006 structure remains a time capsule impervious to a changing world. No wi-fi. Even odder, no AL.com. Though the News and AL.com are separate companies, both are part of the Advance family with the same mission: Turn a profit while informing readers. And yet, the staff of the state’s largest website sits in its own offices a mile away at Pepper Place, which might as well be a thousand miles away. The News, rather than embracing its digital destiny, has found it rather loathsome. The columnists decry the online commenters while doing little to fix the system. The editors hold back more and more content for print only. And while other publications have moved toward more interactive features and storytelling, the News largely sticks to its comfort zone of text, photos and graphics. The print product grows ever thinner, more expensive and less read, a strategy copied straight from the Post-Herald. You may be surprised to learn that at one time, the Post-Herald also had the state’s largest, if only, website, back in the mid-1990s. But by failing to adapt to the audience’s changing news-consumption habits, that advantage was lost over time. It may seem unthinkable that Birmingham could go from a one-newspaper to a zero-newspaper town. This quiet anniversary should serve as a reminder that no publication is safe, no institution sacred. Hopefully, it is not too late for the Birmingham News to learn from the Post-Herald’s demise, before it also becomes a footnote in history. The Birmingham News named Pam Siddall as president and publisher today. The Phenix City native spent the last 2 years a publisher of The Wichita (Kan.) Eagle, part of the McClatchy chain. Siddall, 41, starts Jan. 11, replacing Victor Hanson III, who retired in December. A member of the Hanson family had served as publisher of the daily Advance Publications newspaper since 1909. She was also the Eagle’s first female publisher. Her last day there is Friday. She also has profiles on Facebook and Twitter (@siddallAUfan). 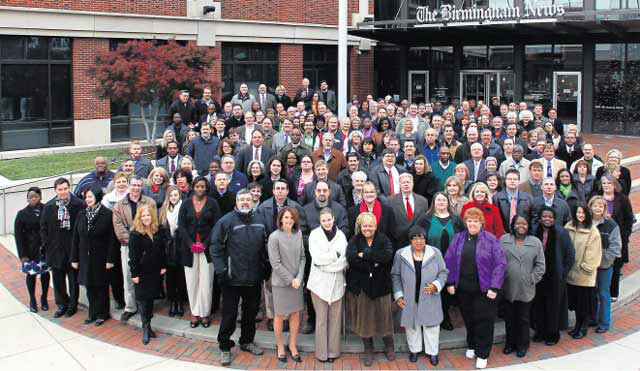 The Birmingham News offered buyouts today to employees, the third round of buyouts in 16 months. Media of Birmingham has learned that all employees will be eligible this round, regardless of number of years of service or full-time or part-time status. Past buyouts were limited to those with at least 5 years of service. Our insiders tell us that full-time employees taking the buyout would receive 2 weeks of pay for every year of service, while part-time employees would receive 1 week of pay for every year of service. Both are capped at 6 months. The daily newspaper is looking for “substantial staff reductions,” this time, but says no layoffs are planned for Feb. 6, when the Advance Publications’ “no layoff” pledge expires. The newspaper has not only faced an advertising shortfall because of the down economy but also a 10.8 percent drop in weekday circulation. Earlier this year, the News cut benefits and required furloughs. Meanwhile, the Birmingham News will look for a publisher to replace recently retired publisher Victor Hanson III. Update Dec. 9: Another insider tells us that the buyouts have been offered at the other two Advance newspapers in Alabama: the Huntsville Times and the Press-Register in Mobile. Also, the buyouts are apparently limited to non-union employees.